the situation in the country regarding cultural heritage and explains why he thinks more should be done by the international community to safeguard treasures which have worldwide importance. Mayar, talking in the wake of the recent return of some 700 objects from Syria, called for a ban on the trade in Iraq antiquities arguing that this would "strip" the commercial value of any items on the market. He then explained about the problems (and expense) of taking action in the courts to prove that antiquities had been stolen from Iraq. He noted that some unsuccessful legal challenges had been used by some to legalise their tentative hold on pieces. He explained that a unified legal procedure across Europe would help to control the trade. He then talked about the problems of trying to post guards at all archaeological sites and suggested that Remote Sensing could play its part in reducing looting. 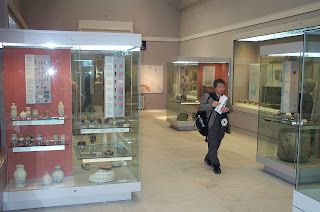 Lawson asked the provocative question about the possible return of Mesopotamian antiquities from the British Museum. Mayar was clearly thrown by the question but then talked about the March 2008 UNESCO conference in Athens and the general international support for the return of cultural property. But, yes, in the long term, Iraq would like to see the return of archaeological material from countries such as Britain. Is the situation this simple? I feel that Philippe de Montebello has something important to say about the spread of significant antiquities between different collections and countries. It sounds as if the concept of the "Universal Museum" is under attack once again. The programme is available for seven days from the BBC website.